Step 1: Make the Vinegar Dip: Melt the butter in a heavy saucepan over medium-high heat. Add the vinegar, pepper, sugar, cayenne, salt, and hot sauce. Reduce the heat and gently simmer for 3 minutes, whisking to dissolve the sugar and salt. Remove the dip from the heat and let cool slightly. Step 2: Generously season the pork steaks on both sides with salt and pepper. Keep the Vinegar Dip warm in a saucepan. Step 3: Set up a Arteflame and preheat to high and use the plancha or grill grate for direct heat. Brush and oil the grill grate. Step 4: Arrange the pork steaks on the grate and grill until sizzling, browned, and cooked through, about 4 minutes per side. Start basting or mopping the steaks with Vinegar Dip once you turn the meat. 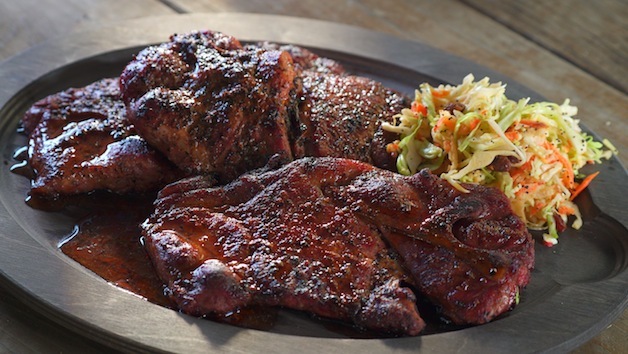 When the pork steaks are cooked, hold them one-at-a-time with tongs and plunge them into the Vinegar Dip, turning to coat both sides. Gluttons for punishment can dip twice, spooning a little extra dip on top before serving. Watch video of Steven Raichlen cooking this recipe on the Arteflame 40" One Series grill.